Vert Shock is an 8 week vertical jump training program created by a former basketball player (Adam) and an elite dunker (Justin). The program mainly consists of plyometrics, which are jumping exercises that can be done on a gym mat/grassy area. One of the main selling points of the program is that it doesn’t require access to a gym. If you see the banner at the top, the program claims to provide a guaranteed 9-15 inches increase in your vertical jump, which is 23-38cm for those in metric. These claims are absurd, and most of the Vert Shock community see results around 2-4 inches if they manage to complete the 8 weeks without getting injured. Who Shouldn’t Do This Program? If you have a history of hip, knee or ankle injuries, are overweight/obese or don’t regularly exercise then this program is likely to do more harm than good. Some strength coaches believe you should be capable of back squatting 1.5 times your body-weight before undertaking any advanced plyometrics, and I agree. Of the 30-40 people I’ve interacted with who have done this program, almost HALF have injured themselves enough to either hamper them or require them to stop training altogether. See below for my YouTube video documenting my results. 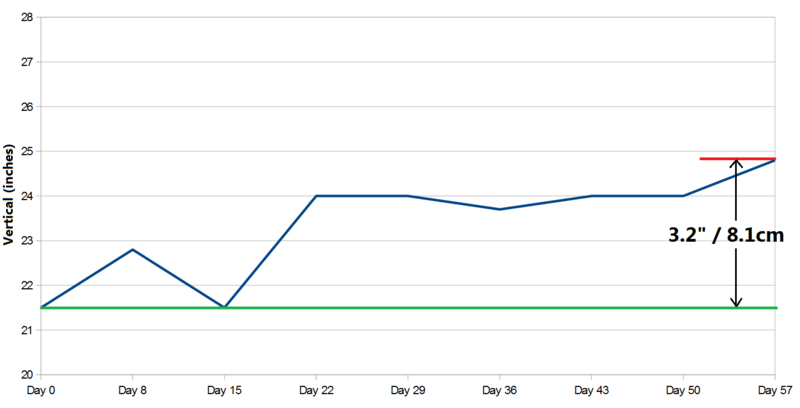 Disclaimer: If you’ve read other reviews which also link you to the program itself, these are likely biased reviews. There is something called Affiliate Marketing, whereby someone receives a portion of the sales profit for directing the customer to the site in the first place. That means if I tell you Vert Shock is the greatest program in the world, then give you a link, and you click the link and buy Vert Shock, I get some money. You will notice I don’t provide any links to the program. Vert Shock’s Pre-Shock Phase is widely available online, and can be seen below. The full program consists of a PDF in this format, as well as video tutorials on the main site and some other additional tips. In this screenshot you can see 9 jumping exercises (Around the Square, Tuck Jumps, Horizontal Bounds.. etc.). The entire program is only 10 jumping exercises, so while it gives the impression this is just a taster, this is in fact almost the entire program. The missing exercise is Split Squat Jumps, which appear in the Day 1 session from week 2 onward. 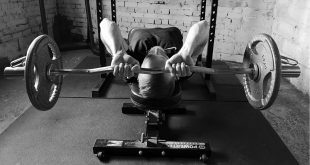 Other than that, there are only minor variations in reps and rest made for the six week “Shock Phase” and a larger change in rest periods during the “Post-Shock Phase”. I enjoyed these exercises and believe they include most of the important plyometric exercises required to improve your vertical jump. 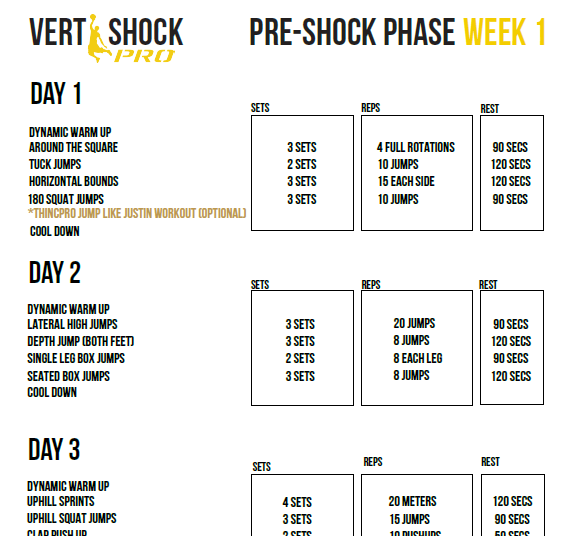 Despite being critical of the complete lack of variation in the program during the shock phase (weeks 2,4 and 7 are identical as are weeks 5 and 6), if these are the best exercises then I’m fine with doing them all several times a week. The program also encourages an extensive warm-up and cool-down, something often neglected by other programs. With an active warm-up you are not only getting the most out of your body during the exercises, you are hopefully reducing injury risk. I really liked the short time of each workout, as although you will find yourself training 4-6 times per week, each session is at most an hour and often less. As with any online program, it’s tremendously over-hyped in order to get you to buy it. He uses trigger words such as “proven”, “guarantee”, “secret”, “unique” and “special” to make you think this program has been finely crafted by a team of experts and will give you an edge over the competition. The truth is these exercises are very commonplace and 3 sets of 8 with 2 minutes rest is not a ground-breaking strategy. Importantly there’s dishonesty here, because in the disclaimer at the bottom of the landing page he admits that “results you see are not typical” and there is “no guarantee” that you will achieve the 9-15 inches previously promised. This is essentially allowing him to greatly exaggerate the effectiveness of Vert Shock in the rest of his promotional material, which he does. His ability to hand pick the most incredible results and make them appear like the standard outcome from the program is not fair on the customer. Some people are destined to greatly improve their vertical jump and would do so on a multitude of programs, so to say it’s only Vert Shock that can deliver these results is incorrect. There’s also no mention of guys like me, who gained a mere 3.2 inches from 8 weeks. Offering a heavy discount on the “original” price. This is known as anchoring, by putting a larger number and crossing it out, you feel like you are making a saving. This occurs regularly in supermarkets. Offering Bonus material. At one time I was being offered 12 bonus PDFs, downloads and freebies for purchasing. Countdown clock. By setting a clock on the page “limited time offer 28 minutes left” it creates a sense of urgency and encourages you to make a more impulsive purchase for fear of missing out. This is used by double glazing salesmen, who will tell you their offer is available for 7 days and after that prices are likely to be far higher. Real Person Reviews. Although these are likely real people, he states in the disclaimer these are exceptional results. There was also a promotion running on his site which gave monthly prizes to the reviews that showed the most progress, thus encouraging customers to inflate the numbers achieved following the program. “Secret” Exercises. This is a pet peeve of mine. I found all these exercises in an old plyometrics book from 1999. There was no original content in Vert Shock. If he was honest about the results, and charged less, this would actually be a decent program. 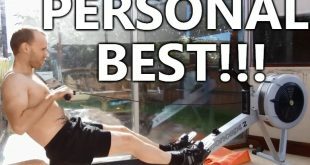 There was a complete lack of upper body exercise which I believe he’s corrected in his latest version, but it’s still an average program that is probably worth around $20. There was a good amount of support regarding the exercises, and I did feel very reactive off the floor after the first few weeks. If my expectations weren’t set so ridiculously high then I would have been relatively happy with a 3 inch gain on my vertical jump.